As WebSphere Application Server installations grow to accommodate the growth of business processing, the question "How large can a WebSphere Application Server cell be?" is being asked more often. 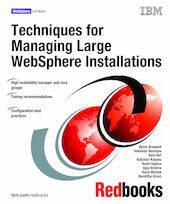 This IBM Redbooks publication discusses large WebSphere Application Server installations, and as you will see, the answer to the question is not straightforward. Numerous variables play a part in supporting or constraining the size of a WebSphere environment. These variables are most likely different in each WebSphere Application Server installation, resulting in a different answer for each environment. This book discusses large WebSphere Application Server topologies, focusing specifically on best practices when planning and configuring the high availability manager, core groups, and core group bridging. A review of high availability, core groups, and core group bridging features is followed by extensive coverage of planning, designing, and implementing a large cell migration. The book then covers detailed scenarios of configuring single and multiple core group topologies. In addition, the scripts, applications, and batch files used to set up and test the scenarios are included as additional material that can be downloaded and modified as required for your specific environment. This book is intended for WebSphere Application Server administrators and planners who are considering migrating their small to midsize installations to larger topologies.